"For Sale" by the Owner – Sell, Buy, or Own Real Estate at Cape Breton, Nova Scotia! 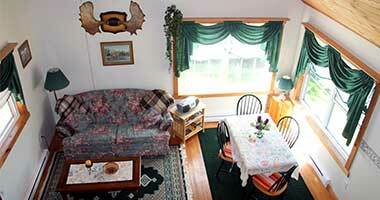 Cozy, comfortable and well equipped cottage on a 36 acre property, right at the Bras d’Or Lakes, one bed-room for two people (max. 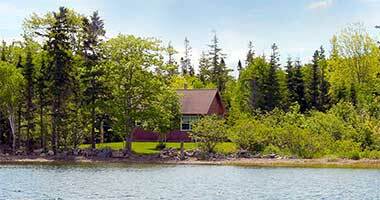 4), your own private driveway, your own lawn and your own water frontage guarantee lots of privacy. 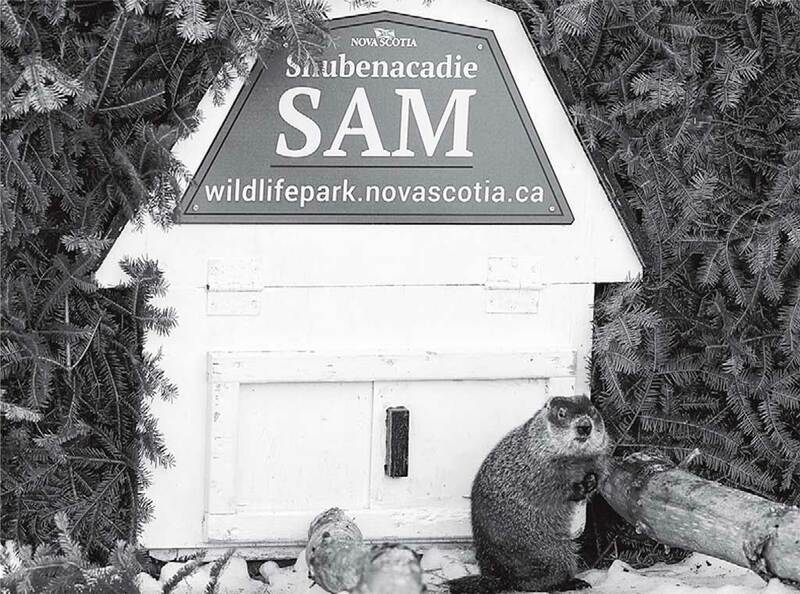 We (thanks to The Chronicle Herald) got scientific proof from a well-known weather forecaster that this year we will have a very early spring. Our fishing rods are set and our new floating dock is ready to be launched. 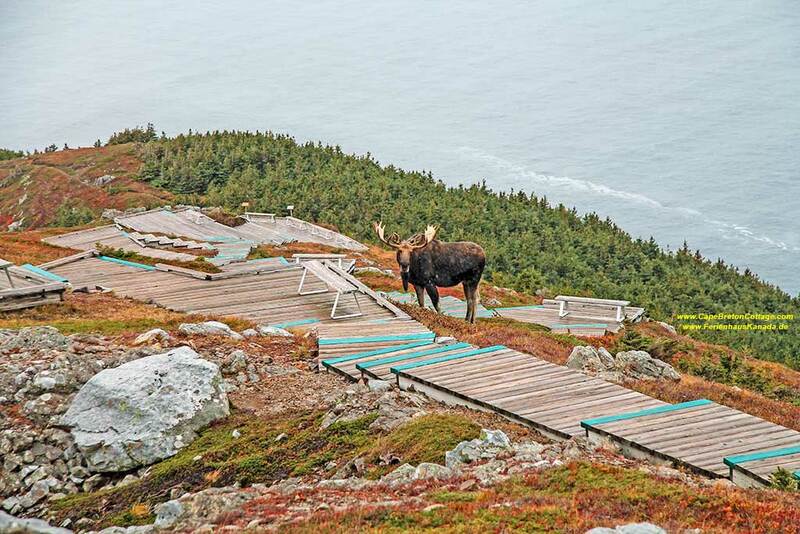 last year we spotted a moose on the Skyline Trail on 3 November 2015. 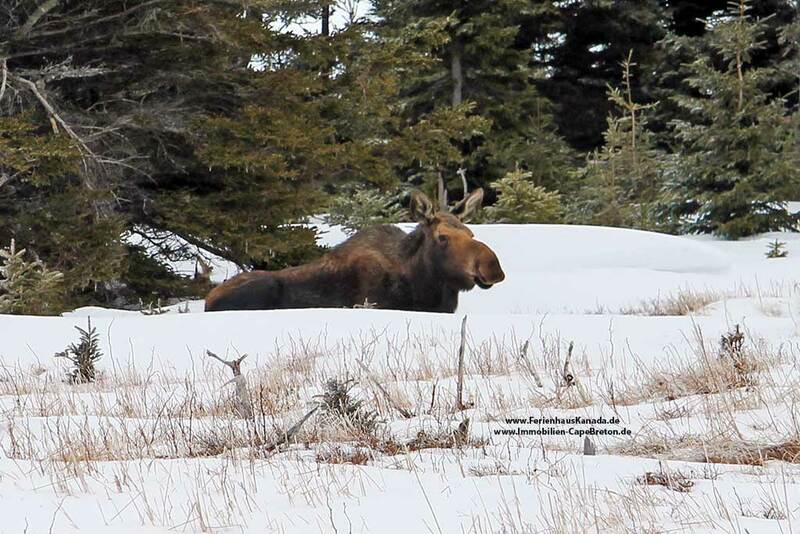 This year we did the same hike on 17 March and we could spot two moose. 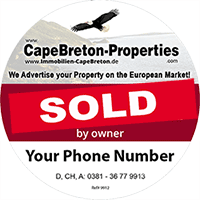 Marketing - IT Service Inc.
We Advertise your Property on the European Market! 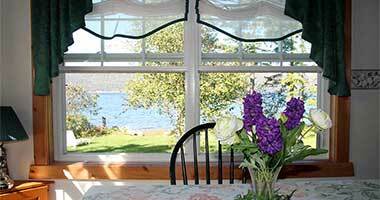 Come and enjoy an unforgettable vacation, here right on the shores of the Bras d'Or Lake, in the center of Cape Breton Island, half way between the Cape Breton Highlands, the Cabot Trail, the Newfoundland Ferry and the Canso Causeway..
We offer a comfortable cottage for two, maximum for 2+2 people, situated just 30 feet from your own beach at the Bras d’Or Lake. On the other end of this 36 acre wooded property, we run a Bed and Breakfast, a private bath room and a separate entrance on the ground level. So there are no stairs for you to climb. 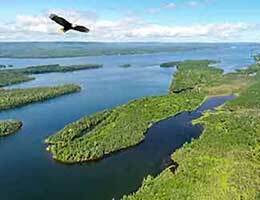 You don’t have to be an extreme athlete or an adventurer - or even a fisherman - in order to enjoy your vacation with us. Seniors, families with children, couples or singles - all are welcome to rejuvenate here in this clean and healthy environment. This place is especially suitable for elderly and those of us, who want much privacy and a very peaceful location right on the water without being in the nowhere. 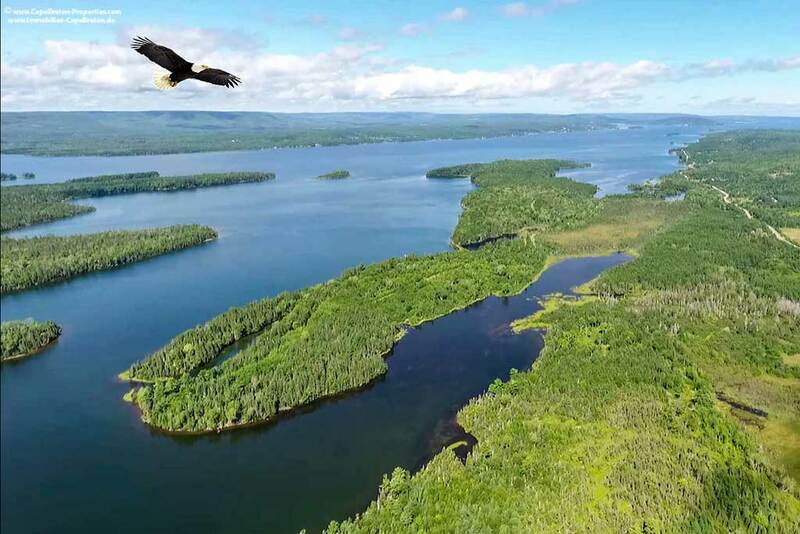 The picturesque Town of Baddeck is just a 30 minutes’ drive away, to Orangedale it is 15 minutes and to the Highland Village Museum in Iona it is around 10 minutes. If individuality and privacy means more to you than being within a group of co-vacationers on a board walk, and if you prefer unspoiled nature instead of looking at a well groomed beach, you might like it here. If you are not interested in smelling what your neighbour has for dinner or you do not like to line up at the check-in office, you are at the right spot with us. 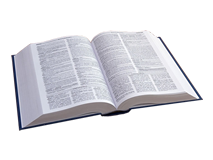 And we are in reach for you - if you want us to be, to help you to make your vacation as pleasurable as possible. Enjoy a delicious breakfast with bacon and eggs “from our own happy chicken” - if you like. Breakfast is served in our log house made from hemlock, pine and cedar. 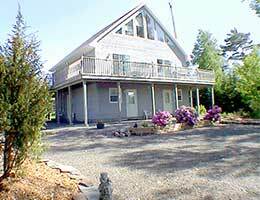 Learn the basics of fishing or fly fish for Atlantic salmon in the Margaree River or fish for trout right in front of the cottage. 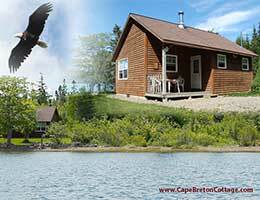 Watch the bald eagles from your breakfast table, or have a look to their nest right besides our barn. 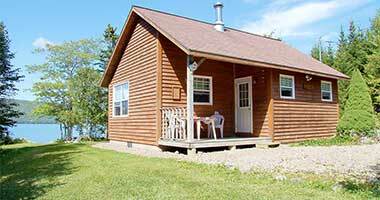 Experience a vacation for the whole family - in a small private environment with family atmosphere, right here at the shore of thye Bras d;Or Lake, at Cape Breton Island, Nova Scotia, CANADA. Reencounter your spirit of adventure - every day again!